The Duchess of Sussex sits down for a meal with women at the Al Manaar Muslim Cultural Heritage Centre. Meghan Markle, the Duchess of Sussex is supporting a new charity cookbook. This is her first solo project as a member of the Royal family. The book; Together: Our Community Cookbook features recipes from women affected by the Grenfell Tower fire. The Duchess, who is renowned for being a foodie met the women in January 2018. 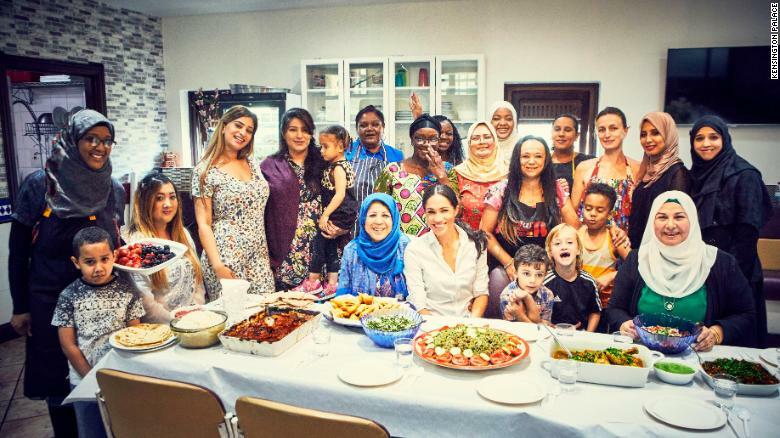 She said in a statement: “I immediately felt connected to this community kitchen; it is a place for women to laugh, grieve, cry and cook together.” Markle put the group in touch with a publisher and her Royal Foundation provided assistance with legal and administrative issues. The project undoubtedly combines two of the Duchess’ biggest passions: cooking and feminism. The former Suits actress has been fighting the fight for gender equality long before it was popular to do so. Together reflects the women’s many different cultures from Europe, the Middle East, North Africa, and the Eastern Mediterranean. It also displays the women’s real stories about what the Hubb Community Kitchen has meant to them. Other than the support for the community, what is so fantastic is Meghan is ambitious, independent and informed; traits that perfectly embody what it means to be a woman today. She has fought for injustice and spoken openly about period poverty and inequality at the highest level of the political spectrum. Meghan Markle hopes that profits from the sales will help keep the kitchen open up to seven days a week. “Melding cultural identities under a shared roof creates a space to feel a sense of normalcy. The universal need to connect, nurture, and commune through food, through crisis or joy — something we can all relate to,” she said. Meghan Markle has been an ambassador for UN Women and served as a counsellor for One Young World. Before meeting Prince Harry, she used her social media channels to brand Donald Trump as “misogynistic” and show her support for Hilary Clinton. We have no doubt that this will be the first of a long list when it comes to feminist endeavours. We personally can’t wait to see what she’ll do next. Together will be available to purchase on September 20th and will be published by Penguin Random House.